Before, mobile phones are mainly used for calling and texting. But with the inevitable rise of mobile data networks, these smart devices have also become indispensable tools for Internet connection. For a decade now, LTE (Long Term Evolution) or 4G is the fastest commercial mobile data available and Smart Communications has made the seamless shift to it since 2011. To bolster the presence of 4G in the Philippines, Smart is now offering 23 LTE-capable smartphones that can be enjoyed by both prepaid and postpaid subscribers. Included in the rosters of LTE devices are Apple iPhones, the Samsung Galaxy S series and the O+ Presto 700, which can be purchased for only Php2,188. Perhaps the most affordable Internet bundle that Smart offers is the GigaSurf 50 which costs Php50 and is valid for three days. Aside from 1GB of data for apps and websites, subscribers can also enjoy 300MB of data for YouTube, iFlix, and more plus 1 day access to ABS-CBN's iWant TV. 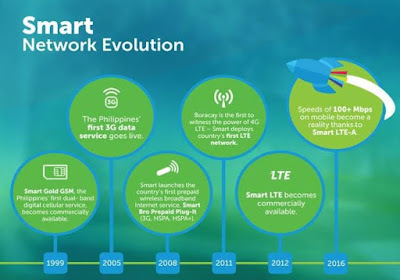 Finally, Smart Communications has also started to unveil LTE-Advanced in the Philippines last April. They have also installed LTE-A sites in Boracay and other public places such as airports. Thanks to the introduction of the 700MHz frequency that was acquired in partnership with Globe Telecom from San Miguel Corporation, this vastly improves 4G consistency and coverage.